The British Cruiser tank Mk VI Crusader was a fast, lightly armored tank that primarily served in the Western Desert of North Africa during 1941 and 1942. 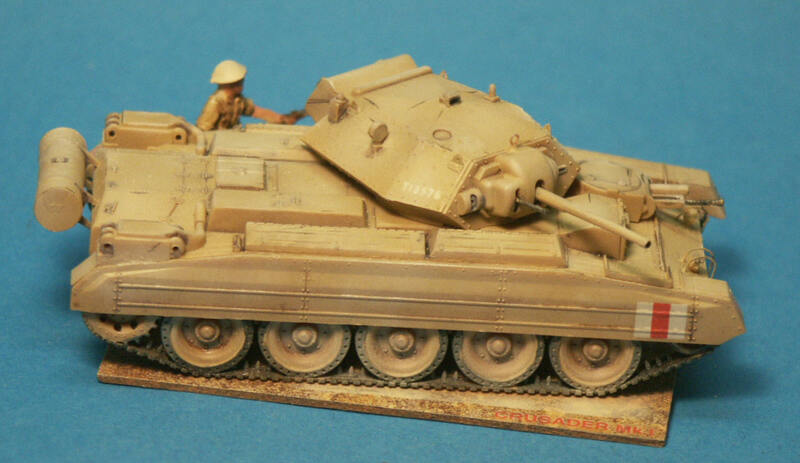 In reference to potential wargaming and diorama use, the designation "Cruiser" tank indicates that it was to be used in exploitation of a breakthrough, relying on its speed rather than armor. The box art shows a three view profile of the Crusader painted in what the instructions call Light Stone color. On the skirt and turret are markings, though no division or unit markings are shown on the bow and stern which was common for Crusaders in North Africa. The S-Model kit is of a Crusader Mark I or Mark II, both versions being armed with the 2-pounder (40mm) high velocity gun. It can be modeled with or without a small machine gun turret next to the driver's location. Note that the drive sprocket is in the rear, as most tanks of this period had their drive sprocket at the bow (front), this is important to remember so we don't mistakenly switch it during assembly. On the front we see the small MG turret, at the very rear is the auxiliary fuel tank. The many bolts are portrayed on the turret (yes bolts, not rivets). Note the five large road wheels. Though this looks like the tank has a torsion bar suspension, the Crusaders used a Christie suspension like that of the Soviet T-34 tank. 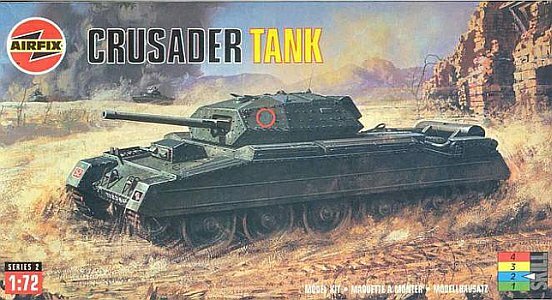 The Airfix box art depicts a dark green Crusader tank in a mountainous area that I presume to be Tunisia, it does not look like England. I understand that green camouflage Crusaders did serve in the Tunisian campaign, while those in Libya and Egypt were desert tan color. The tank is wearing its side skirts, supposedly to keep down dust. There is no auxiliary small MG turret on the front but there is a fuel drum on the rear of the engine deck. Like with Soviet tanks and their exterior fuel tanks, these tanks would be shed before entering combat. The tank is armed with the 6-pounder gun with internal mantlet indicating it is the Crusader Mark III. 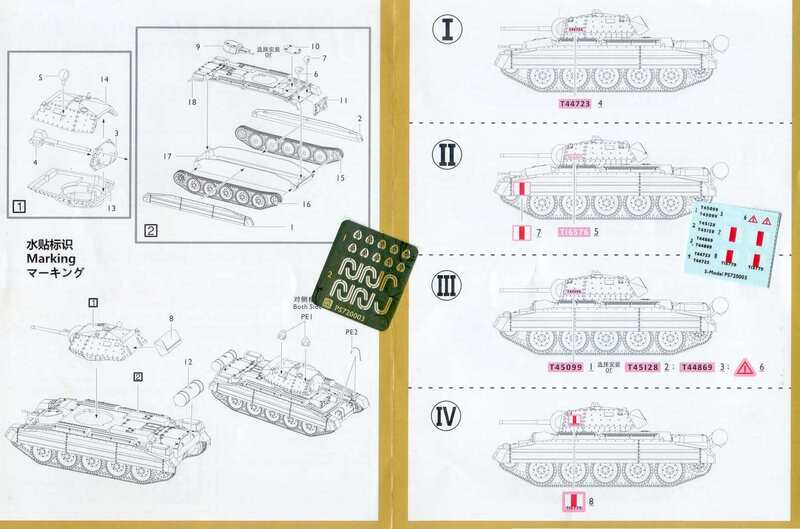 The small scale at the lower right tells us that assembly is a skill level 2, suitable for beginner modelers. 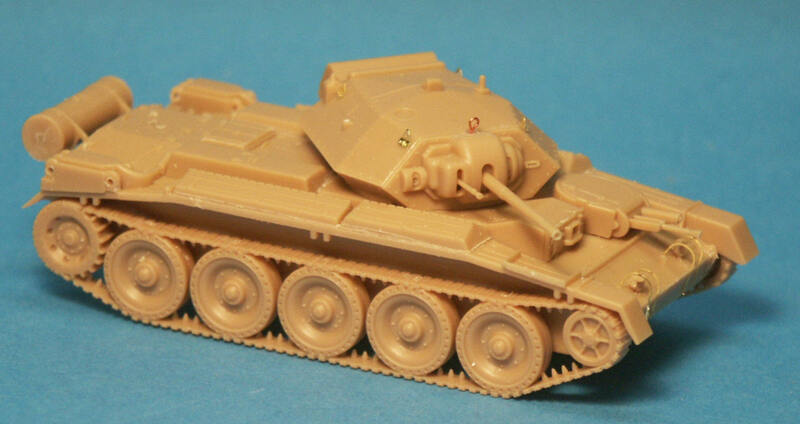 The S-Model Crusader consists of 18 injection molded, light tan colored, styrene plastic parts, all on one sprue. There are two sprues in the box to build two complete models. At upper right is the upper hull with decent detail of the hinges and fittings, but a little simplified for a wargaming model. A good display model would have things like the storage boxes and exhaust system, etc. as separate molded parts. Most of the rivet detail is missing from the hull also. At center right is the hull bottom and notice the large gap on the sides this would be the location of the springs of the tank's Christie suspension. The turret at upper left has the hatches molded closed but has fine rivet detail. Below the turret is the turret front plate with gun mount for the 2-pounder. The gun barrel at lower left is slide molded with the muzzle opened up, thus no drilling required. The suspension parts at lower right come as one complete unit that mount on the hull sides and are wonderfully detailed. For a one piece unit they are very well done, even the track surface detail, and the guide teeth. The drawback to a simplified construction like this is that the wheels cannot be molded as a paired set of road wheels with a gap between the wheels for the track teeth. Some makers mold the inner road wheels attached to the tracks and have separate outer road wheels, but more parts equals more cost and complexity. The Airfix model consists of about 60 pale green injection molded styrene plastic parts and two semi-soft plastic band tracks. 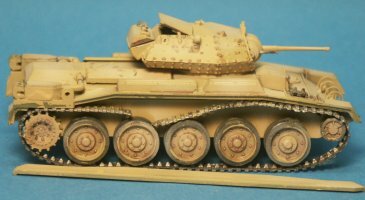 The kit was designed and first produced in the 1970s so it's from another age when it comes to molding technology and the modeler's demand for correct detail, but still it is pretty good. 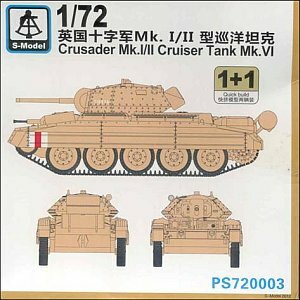 More information on the Airfix Crusader kit can be viewed at Henk Of Holland's website. When reviewing a kit I cannot help but compare it to another manufacturer's rendition of the same vehicle. 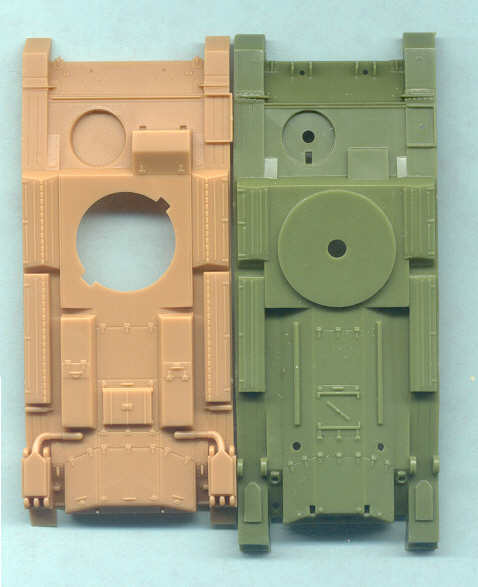 In the picture at left, the tan hull is for the S-Model Crusader, and the green hull is from Airfix. The Airfix kit is an older kit and first marketed as 1/76 scale, though my box is a more recent release and is advertised as 1/72 scale. We find some puzzling dimensional issues here. The supposed 1/72 S-Model kit is shorter in length than the supposed 1/76 Airfix hull! 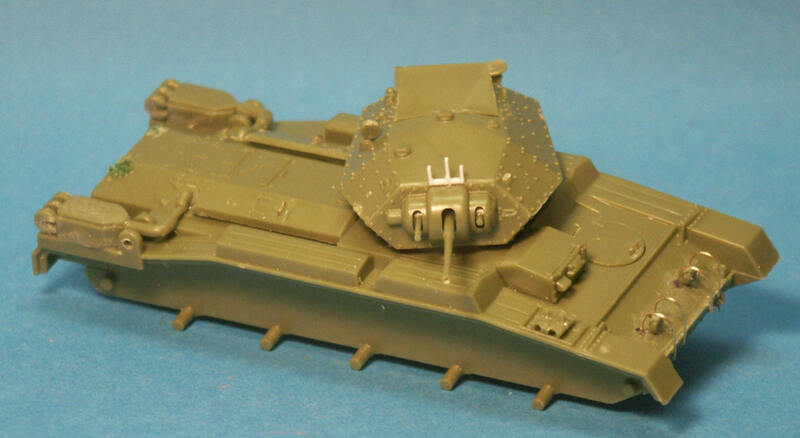 In contrast the Airfix hull appears narrower than the S-Model hull. The sizes of the storage boxes are also inconsistent, but perhaps this is due to production variations? On the rear of the mudguards there is some piping and small boxes that I first took for muffler and exhaust pipes but these are in fact the intake air cleaners (filters). The assembly instructions for the S-Model Crusader are a simple, 3-step, exploded view style. 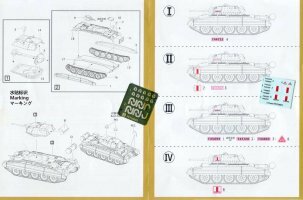 On the right side of the sheet are guides applying the water slide decal markings for four Crusader tanks serving in North Africa. The small decal sheet is at far right. No information on the AFV's units or time period is given. In the center above is the small etched-metal fret containing headlight brush guards and lifting rings for two Crusader models plus several extras. The S-Model kit will be assembled as a Crusader Mark I which has the characteristics of: 2-Pounder gun with auxiliary MG turret. Assembly is so quick and easy that I did not see much sense in showing the steps. We slip the upper hull down onto the lower hull, glue the upper turret half to the lower turret half with the gun barrel in between, slide on the left and right track and wheel parts. The hull and suspension parts fit tight and mine probably did not need glue. The kit’s etched brass lift rings on the turret and the brush guards on the bow have been glued on. I tried to assemble this straight out of the box and tried not to detail, but just could not help adding some additional detail. A sight ring for the commander was added above the mantlet, holes were drilled in the air cleaner parts. The side sand skirts are left off till painting is done. The three pairs of rods sticking down from the mudguards are for mounting the sand skirts. This photo of the left rear quarter shows a nicely detailed engine deck similar to the Aifix kit’s engine deck. There are some small size and shape differences in the fender storage boxes between the S-Models and Airfix Crusaders. Another small detail I added was a shovel on the rear of the turret box. The Airfix model will be built representing a Crusader Mark II with the characteristics of: 2-Pounder gun with no auxiliary MG turret. The Airfix kit has many more parts than the S-Model kit so assembly will take longer and be more detailed. Looking at the engine deck we can see better rendered air cleaner parts and the separate air vent covers (parts 65 & 66) make for a more accurate display model. A 3-vane sight for the commander (based on a reference photo) has been added atop the mantlet and new headlight brush guards made from brass wire. Part of the kit’s auxiliary fuel tank was missing so I left the whole fuel tank and support off and plugged the mounting holes with model putty. 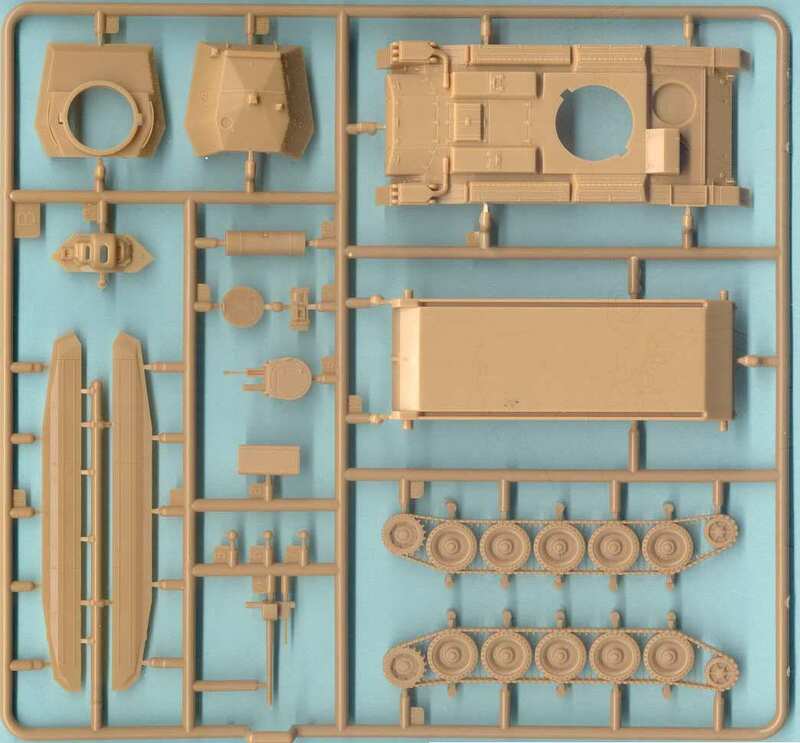 Airfix’s Crusader has many of the bolts that are missing from the surface of the S-Models hull. 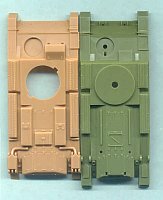 While S-Models molds their hatches closed, Airfix offers open hatches for their two turrets included within the kit. Open hatches would reveal no interior turret detail. 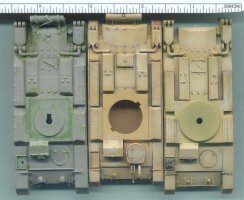 The Airfix turret for the Crusader Mk I and Mk II versions is interesting in that the large hatch covers the rear 2/5ths of the turret roof and the hatch tilted up at the rear to allow a small opening for vision, or it lifted up and slid to the rear for egress and ingress. Airfix’s Crusader wheels look good and are the correct paired, twin wheels, but their face detail is not as sharp and as good looking as the S-Model wheels. 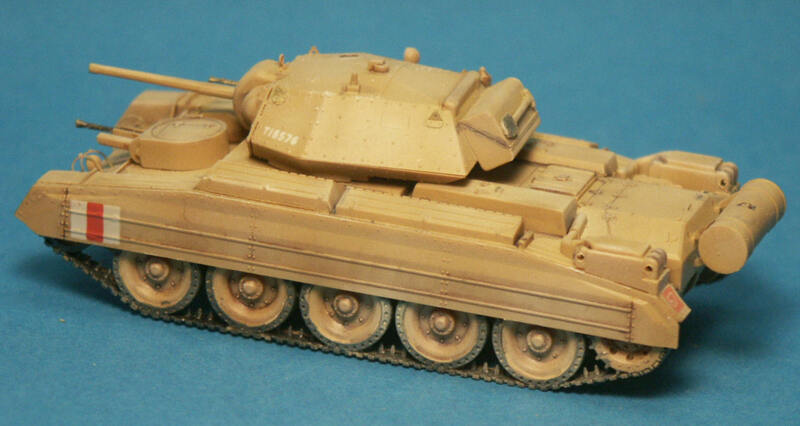 The S-Model Crusader was then completed with a light coat of Radome Tan color over a Light Tan base coat helping to blend in the black and brown point wash. The S-Model supplied water-slide decal markings applied well over a gloss clear coat, then acrylic dullcoat to cover the gloss coat. I added a unit marking to the left rear fender to add color but this is not likely to be historically accurate, sorry. Unlike the Hasegawa Crusader Model, S-Model offers no fuel line going from the auxiliary fuel tank to the engine deck. This can easily be replicated with some copper wire or fine solder wire. 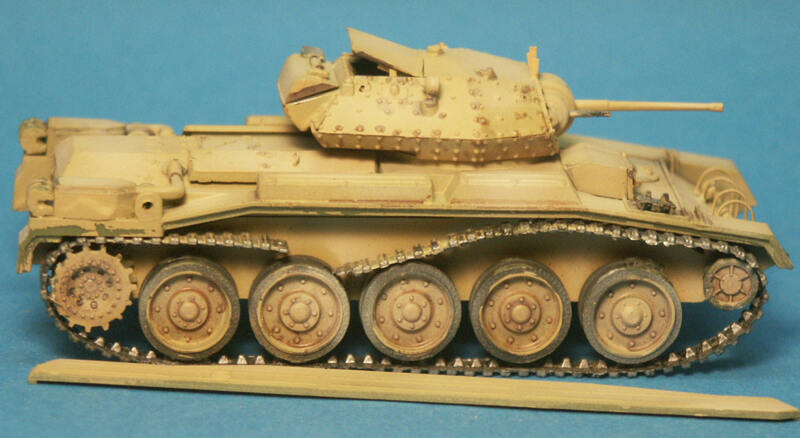 Both Crusaders were finished with desert tan acrylic paint, a point wash of water based dark brown or black, then a light coat of Radome Tan on upper surfaces to simulate sun bleaching. Tracks were given a coat of acrylic gun metal color, the a dark wash and rubbed with a graphite pencil to simulate wear of the metal in the desert sand and minimal rusting in dry desert conditions. The machine gun barrels and shovel blades were also rubbed with a graphite pencil. The kit tracks were used for both models and both the Airfix and the S-Model decals applied well with a little decal solvent to help them settle in around the bolt detail. 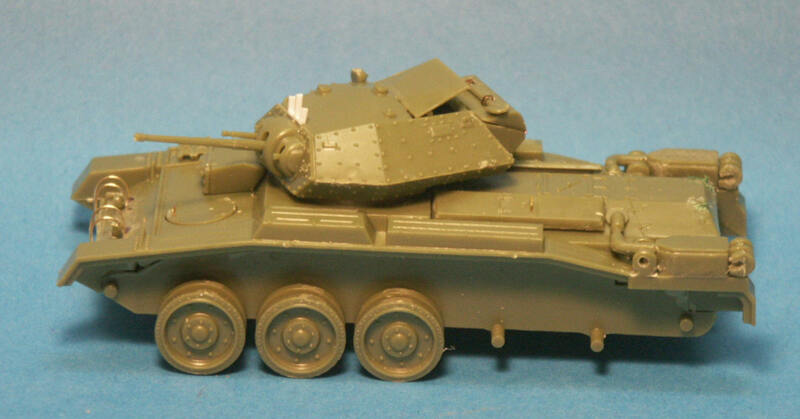 The Airfix Crusader, here with the Mk II turret, was painted in much the same way as the S-Model Crusader. Above is my test fitting of the Airfix band tracks. Track detail is poor, with no inside link detail but at least it has guide teeth. The tracks appear to be made of the same stiff, glue resistant, polyethylene-like plastic as some old ESCI kits. Curse you Airfix! The tracks are a little short and affixing the ends together and putting them around the wheels would have been too much stress on the wheels and likely broken the idler and sprocket off! Above I toyed with the idea of using some etched brass tracks from PART (no. 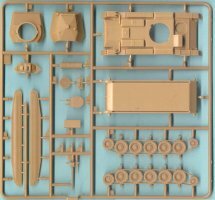 P72-107) for Vickers 6ton, 7TP or T-26 tank kits. They certainly look no more inaccurate than the Airfix tracks but are a whole lot easier to work with. Note that for this photo the Airfix Crusader is wearing the turret armed with a 6-pounder gun making it appear to be a Crusader Mk III. Obstinance got the better of me and resolving to conquer these tracks and make them usable all my known tricks would be used to whip them into shape. Heating them in very hot water while wrapped around a form got them to stay in the general shape better than with my earlier test fitting. Much of the tricks to hold the track in shape would be hidden by the sand skirt. Around the sprocket and idlers, blocks of styrene jammed between the track and mudguards held the track down around the curve. Steel wire inserted through holes in the lower hull held the track down between the road wheels to imitate track sagging under its weight. Thread through the lower track and run up through the upper track run and around the road wheel axle held the track tight against the road wheels. Finished! The base is a small chip of sample Formica left over from kitchen remodeling coated with white glue and fine sand. The model is attached with white glue and then the model and the base were touched up with a mist of Radome Tan paint. Stowage has been attached to the hull and turret. The figure is for perspective. 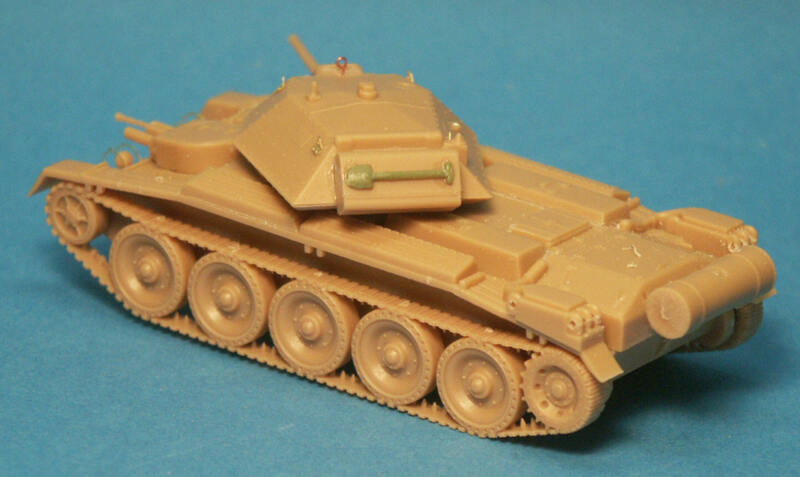 It is a soft plastic Revell 8th Army figure from Revell. The figure had a lot of flash and the molding was not in register resulting in a malformed face. 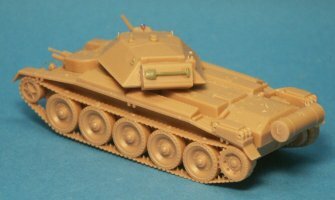 Measurements showed that the S-Model Crusader is 1/73rd scale in length, 1/75th in width and 1/75th scale in height when compared agianst the dimensions listed in CRUSADER Classic AFVs No. 1 [Crusader length over all is 598.2cm (without auxiliary fuel tank), width with side skirts is 276.9cm, and width is 215.9cm]. In comparison I measured the Airfix Crusader to be 1/70th scale in length, 1/77th in width and 1/67th scale in height. Another conundrum. The 1/76 Airfix Crusader at right is noticeably taller than the 1/72 scale S-Model Crusader, even though the Airfix model does not yet have the tracks installed. Also evident the significantly more accurate rear of the Airfix Crusader at right with the large engine ventilation louvers and rivet/bolt heads. Airfix's air cleaner intake parts on the fenders, and the tow pintle also look more accurate, but neither looks perfect. 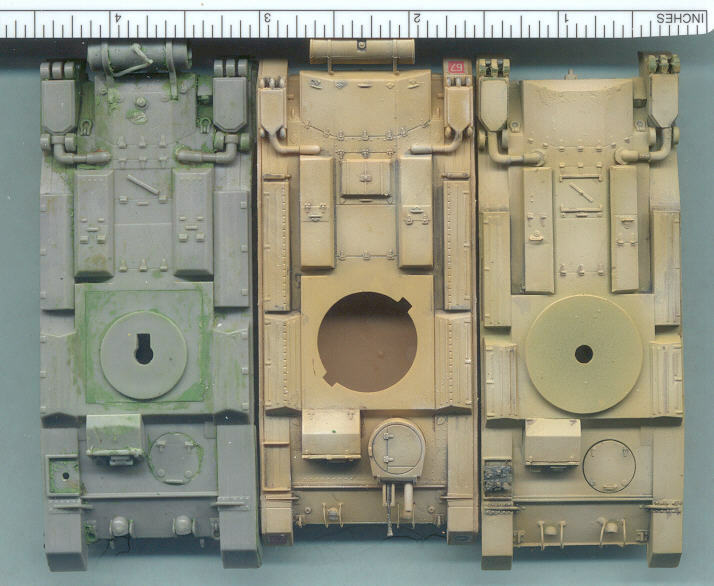 Above is a comparison of the hulls starting at far left with the gray Hasegawa kit, in the center is the S-Model kit and at far left is the Airfix Crusader model. Looking at these and considering their respective scales, I wonder if the Japanese, the Chinese and the English all use different metric systems for initial measurements of the full scale Crusader? I have found the Hasegawa Crusader to be about 1/70th in length, 1/76th scale for width and 1/67th scale in width. Looking at these measurements it appears that all three of these models are all over the place in scale but the S-Model kit to be the most consistent. The road wheels for the S-Model Crusader and the Airfix Crusader both measured at 1/70 scale. Both kits assembled well and well represent what a Crusader tank looks like. Both tanks have pluses and faults and I cannot give an opinion as which is overall a better model. If I wished a gaming model I would chose the S-Model kit. If I wish for a good display model I would combine the best parts from both kits. For example, the distance between the idler and sprocket for the S-Model kit is 7.8 cm while for the Airfix kit it is 8 cm, just a 2mm difference. Based on this we could likely getting away substituting the nicer S-Model suspension and tracks for the Airfix wheels and tracks. Airfix Crusader purchased by the author. 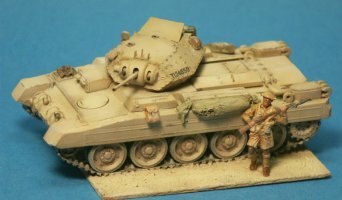 S-Model Crusader supplied by Brian Walsh of The Hobby Den.